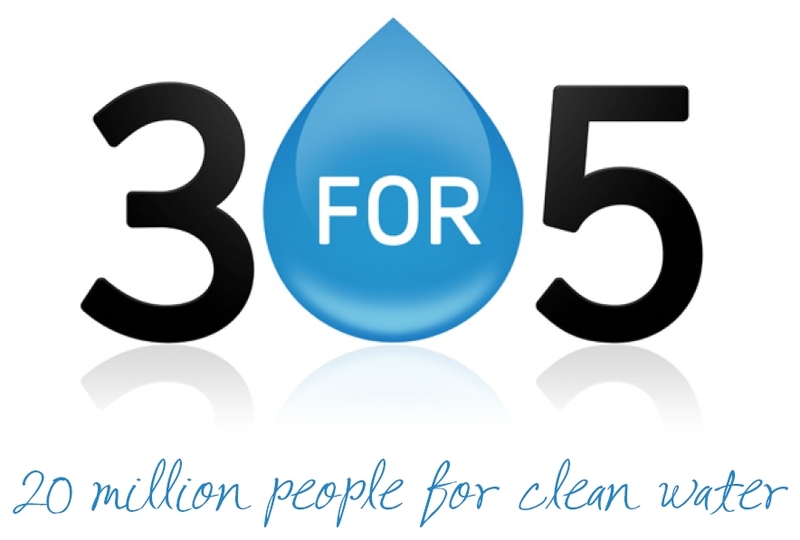 This week our water profile is for the charity 3for5! First founded in 2008 by David and Lenee Fuelling, this organization seeks to provide clean water to people in developing countries. child dies from a preventable water-related illness every 21 seconds, but if those with the means to do so contributed as little as $5 to help solve the clean water crisis, and then convinced three of their friends to do the same, then each of those people would be able to make a huge difference in many lives. With their first $50,000, 3for5 is partnering with Millennium Water Alliance (MWA) to provide water to schools in Nigeria; they’ve also worked with Water For People to help provide water for villages and schools in Malawi. Check out their website here! And go see the t-shirt on the Love+Water Designs website that was inspired by 3for5 – part of the proceeds for that shirt goes directly to the charity! This week we’ll be taking a look at 3for5! The idea that inspired 3for5 was first conceived in early 2008. After a discussion with friends one night about, David Fuelling and his wife, Lenee, were concerned about how the lack of clean water in developing countries was affecting the health of millions; the situation is so bad in some parts of the world that every 21 seconds, a child dies from a preventable water-related illness, most commonly diarrhea. It occurred to David that if those with the means to do so contributed as little as $5 to help solve the clean water crisis, and then convinced three of their friends to do the same, then each of those people would be able to make a huge difference in many lives. Lenee coined the name 3for5, and with that the non-profit organization was born. Since then, 3for5 has evolved in a massive community, each of whom has contributed $5 and invited three friends to contribute $5. If this happens over and over again, in 15 waves the organization can reach 20 million people! With their first $50,000, 3for5 is partnering with Millennium Water Alliance (MWA) to provide water to schools in Nigeria. The organization is also participating in a joint initiative with Water For People to help provide water solutions to 20 villages and 5 schools in Chikhwawa, Malawi. You can check out their website and do your part to help those in need by clicking here. And go see the t-shirt on the Love+Water Designs website that was inspired by 3for5 – part of the proceeds for that shirt goes directly to 3for5! Also, a while back we interviewed founder David Fuelling about 3for5 – click here to read! Love and Water featured on 3for5.org Blog!!! And be sure to look at what David is doing with 3for5.org– it’s such a simple, amazing concept that further proves a lot of a little adds up to a lot, fast. Meet David Fuelling of 3for5.org! David Fuelling started talking to some of the kids of his church youth group about the lack of clean water around the world, and decided to do something about it. So he started 3for5.org, an organization that raises money for clean water through an amazing mathematical concept: reach 20 million people who all give $5.00. And they’re well on their way to meeting their goal! 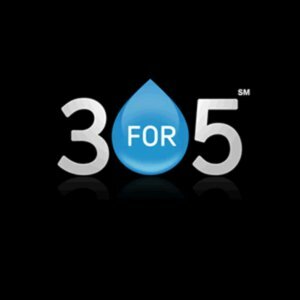 Love and Water- How did you come up with the idea for 3for5? David Fuelling- My wife and I were volunteering for our church youth group and we were trying to get the kids interested and involved in something bigger and greater than what they deal with everyday. We started talking about worldwide humanitarian issues, and I knew that places in the developing world lacked clean water but didn’t know exactly how dire the lack of clean water is in some areas. There are nearly a billion people who don’t have clean water, so it’s a huge issue. So many kids die every year from lack of clean water. We knew we wanted to help and it seemed such a huge undertaking because we don’t have millions of dollars. But we do have some friends, and those friends have some friends, and we thought that we could start there. Everybody can support clean water, so we thought it could just be a function of getting the word out and seeing how much support we could get. L&W- Where did the initial funding come from to start the organization? DF- We went to friends and family, and there were a couple of family friends who really got behind the mission. They helped us come up with some ideas and helped us really get it off the ground. We launched our website in September of ’09 and we just broke $8,400.00, which seems small in the grand scheme of things but it has really helped us see how the concept we put together is working. Most donations are $20.00 or less, so we’ve done really well considering the structure we’ve set up. I think it will take some time to reach our goal of 20 million people, but it’s very doable. L&W- Can you explain the mathematics behind the concept of 3for5, since it’s such a brilliant idea? DF- Every time a person invites three friends and each person gives $5.00, that’s $20.00. We call that a “wave” of clean water. When those three friends invite three friends to give another $5.00, then nine more people are involved and we call that another “wave.” So every time a person gets three friends to join they form a wave. It only takes 15 waves of a social network to reach 20 million people. It’s exponential growth of the community as we move forward. So far we have people who have made five waves, which is really inspiring. It will start off rather slow, but then every time someone can add three friends the growth triples. L&W- What is the most moving experience you’ve had so far watching your organization grow? DF- Becoming aware of what is going on in other countries because of their lack of clean water is up there, for sure. That’s what got us to move and to act. I would say on par with that is the amount of people who have actually come to us and said they want to help somehow. That has been really tremendous because my wife and I would never have been able to do this alone. Early on we were talking to a friend who is an attorney, and she loved the concept from the start. She offered to ask her law firm if they would want to represent us, since they took on pro bono clients occasionally. They ended up taking us on, and so all of our legal help has been free. We were really moved by that, and that’s just one example of how friends and family have volunteered to help. L&W- There are many water charities working to end this problem around the world. How do you interact with them to help each other? DF- There is a lot of data that proves that a community does better when they own their own water system, so a lot of water charities are making sure that happens. We are primarily focused on the charity side of things, although we’re always talking to other organizations to see what they’re doing in terms of getting creative and intend to support them as time goes on. Once we raise our first $10,000, Water for People will be our first grant recipient. Another great organization is Water Alliance, which is a group of water charities helping each other. The hard truth is that there is just not enough charity money to solve the problem, so there has to be the sustainablility aspect, where people are able to learn how to build their own resources to provide themselves with clean water. We’re of the opinion that we want to concentrate on fundraising so we can support the many great organizations that have the capacity to build wells and interact with the people. We want to help them do more of that, so partnering is the key. L&W- How has social media been helpful in raising awareness for you? DF- Social media has been a major catalyst in raising awareness and getting people involved. We had the pleasure of going to Blog World, which was a social networking competition that Ebay and Pay Pal put on, and the idea was to vote for your favorite charity. We used Facebook and Twitter to rally our troops and ended up in the top ten, so we got a free pass to Blog World. Email has been huge for us as well. That is one of our primary conduits of communicating with our followers. We send regular emails to keep in touch. All aspects of social media have been extremely helpful in different ways. L&W- Is there anything else people should know about 3for5? DF- *We’re trying to raise our first $10,000.00 in the next few weeks, and we’re really close. As soon as we raise that we’re going to give our first grant to Water for People. So we would love for people to make a few waves and help us reach that goal. L&W- Thanks so much for sharing with us, David. DF- It’s my pleasure. Thank you- we look forward to being further involved with Love and Water. *As of Monday, February 8, 3for5.org reached their first $10,000.00!